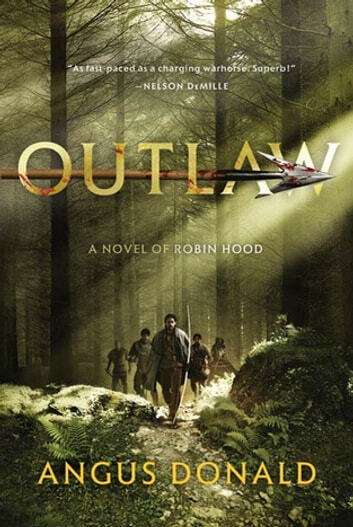 In the tradition of Bernard Cornwell and Ben Kane, Outlaw is a rousing historical novel that mixes legend with fact to bring to life the time, the lives and the struggles of late 12th century England. As the Henry II struggles with his rebelious children and the conflict between the Saxon nobility and the Norman conquerors continues on as bloody as ever, there is a figure that has remained firmly fixed in the imagation of generations - Robin Hood, an outlaw and a renegade nobility determined to bring down the men who took his land, his family, and his position. When he's caught stealing, young Alan Dale is forced to leave his family and go to live with a notorious band of outlaws in Sherwood Forest. Their leader is the infamous Robin Hood. A tough, bloodthirsty warrior, Robin is more feared than any man in the county. And he becomes a mentor for Alan; with his fellow outlaws, Robin teaches Alan how to fight - and how to win. But Robin is a ruthless man - and although he is Alan's protector, if Alan displeases him, he could also just as easily become his murderer...From bloody battles to riotous feast days to marauding packs of wolves, Outlaw is a gripping, action-packed historical thriller that delves deep into the fascinating legend of Robin Hood. Well written... filled with with a lot of humor and a well illustrated battle tale of Robin alongside with frail Alan who later became a strong warrior.